Slathered with cheese and chilli, topped with sauerkraut and jalapenos or buried under mac and cheese, hot dogs no longer have to be topped with ketchup and mustard basics. The nostalgic snack has been given new life on the foodservice scene by operators who are focusing on gourmet toppings and upscale international flavours. For foodservice operators, hot dogs signal value, appeal to their customers with grab-and-go lifestyles and importantly, they are very easily customised. Adding premium products and decadent toppings to this inexpensive menu item is the trick to creating a hot dog worthy of a cult following. Once just a quick bite at the football, hot dogs have made their way onto menus as gourmet offerings as venues start getting creative with toppings. Whether you're serving a chilli dog, currywurst or a good old frankfurt there is always room for creativity. The upward trend in gourmet hot dogs has inspired Speedibake to launch a Gourmet Brioche Style Hot Dog Roll, allowing venues to offer these premium products at a higher price point. A premium roll ready to be stuffed with meat and toppings is a blank canvas for hot dog experimentation. By adding premium style breads to hot dogs, outlets can price their offerings at a higher point, not only increasing margins and profits but also customer satisfaction, as diners know they are getting high quality products with their order. Part of the innovative Speedibake range, the new hot dog roll can be thawed and served immediately or flash-baked in only minutes. It caters to demand for reduced baking times and convenient quick-to-table products. 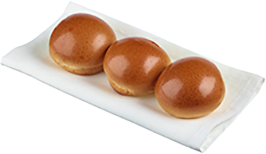 With soft, golden crumb and smooth buttery flavour, the brioche style roll has been designed specifically for pubs, clubs, restaurants and cafes that are looking for a premium offering for their menus. See the full brioche range, which also includes burgers and sliders and contact your local distributor to place an order.